First published 8th April 2015, last updated 8th August 2016. Article from Stephen Hamil, Director of Design and Innovation at NBS. Stephen looks at how the Toolkit can be used at an early stage of a project to support the preparation of Employer's Information Requirements. He then looks at how this information can grow through the project time in terms of design management, construction and then ultimately hand-over of information to the client. In May 2011 the UK Government Construction Strategy was published. This report announced the Government’s intention to require BIM on its projects by 2016. The objectives behind this strategy were simple: build and operate assets more efficiently in terms of cost, reduce environmental impact and improve UK exports of professional services and construction projects. In terms of the definition of BIM, a five year funded programme was developed that would deliver BIM level-2 via a world-class set of standards and tools. 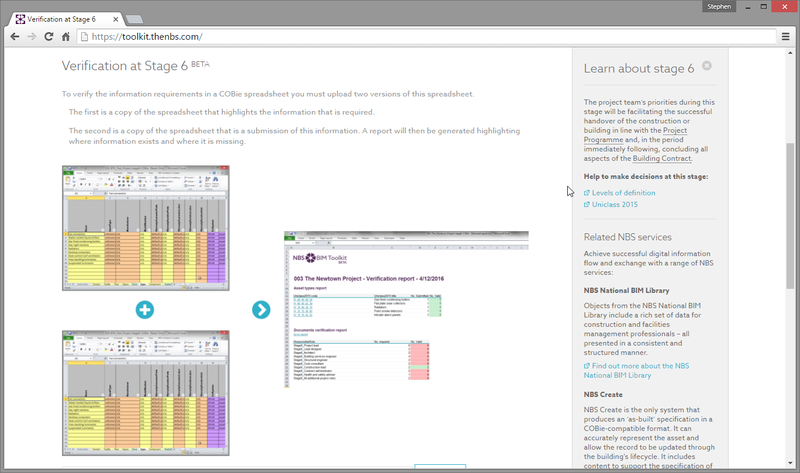 This NBS BIM Toolkit is part of this level-2 package and includes a library of thousands of cross-sector construction level-of-definition templates and a unified classification system. It also includes a free-to-use digital plan of work tool that enables the definition of who is doing what and when throughout a construction project. The team that NBS assembled to complete this work included BIM Academy, BDP, Laing O’Rourke, Microsoft, Mott MacDonald, Newcastle University, RIBA and RICS. Thanks must also go to a cross-industry institutions’ group that helped steer the NBS team on a monthly basis through the development phase; the following were represented: APM, BIFM, CIBSE, CIOB, ICE, IStructE, RIBA and RICS. Since the funding period, NBS has continued to invest in product development based on feedback from users on real projects. 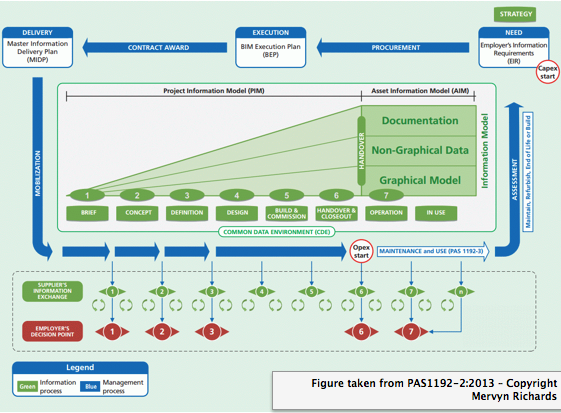 This article looks at how the NBS Toolkit fits into the digital project lifecycle as defined by PAS1192-2:2013. A project begins at the Strategy stage by considering ‘Assessment and Need’. As part of this exercise the client will consider what questions they will have that need answers as the project develops. 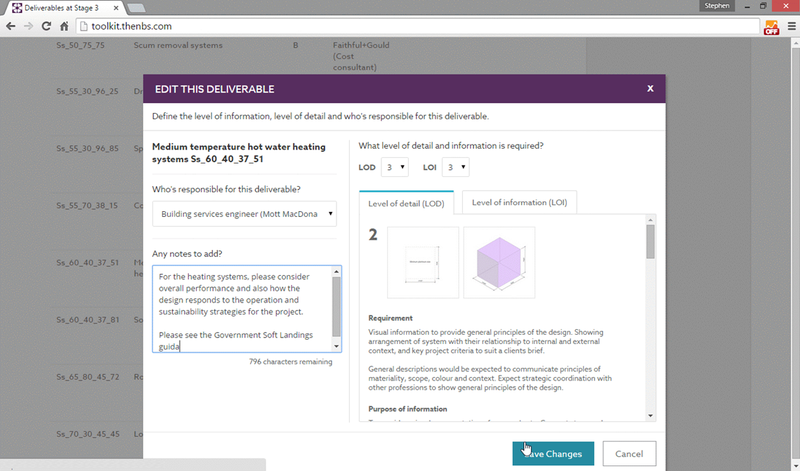 Within the level-2 BIM process a set of Employer’s Information Requirements will be generated that considers the procurement of digital information in addition to the procurement of the physical asset. The specific information required to provide answers to the client’s ‘plain language questions’ is determined and this is aligned to the relevant stage of the project. Figure 2.1 below shows that the Toolkit can be used to align tasks to the roles responsible for delivering this service at each project stage. 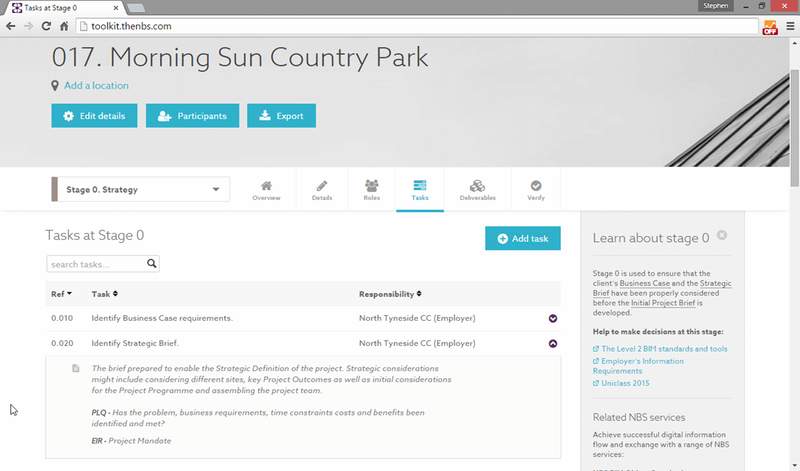 Project templates – A number of construction industry templates are available. For building projects there is a template based on the tasks within the multi-disciplinary schedule of services developed as part of the RIBA Plan of Work 2013. At NBS we have also worked closely with those leading the way across the infrastructure sector. So templates are also included that are a strong starting point for geographical and linear infrastructure. 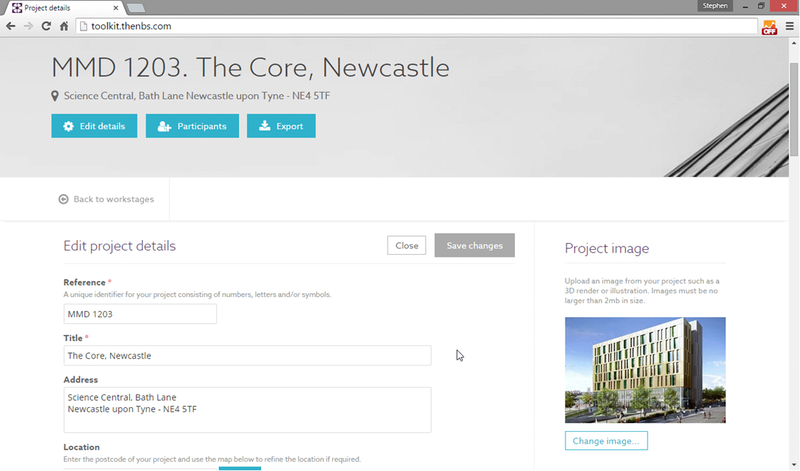 Project examples – We are working with project teams with BIM level-2 experience. Where we receive case study digital plans of work we will include these here so that others can view example projects. Existing projects – Once a project is complete and lessons have been learned from what went well and what could be improved, then this project can be refined and easily re-used on the next project. All information from the BIM Toolkit may be exported and then imported into other user’s systems. Our hope is that other information providers and private clients will create templates and make these available on their websites and extranets. 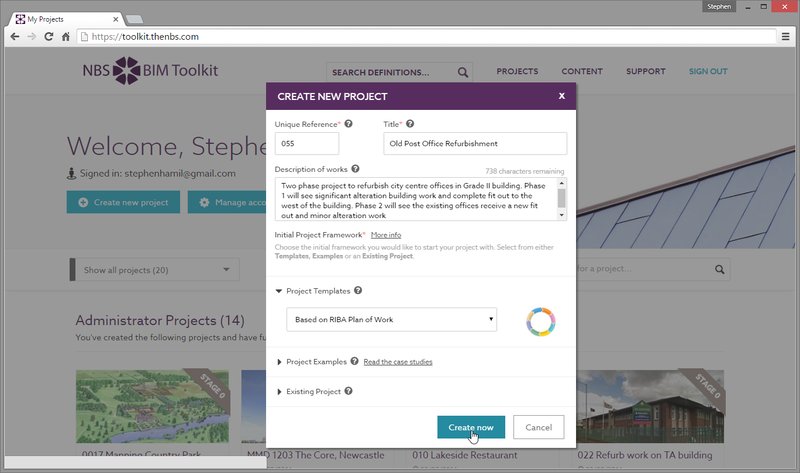 It is easy to create a Toolkit project by browsing to a template file created and maintained by any information provider. Figure 2.2 below shows the new project wizard and the user creating a new project from a template. 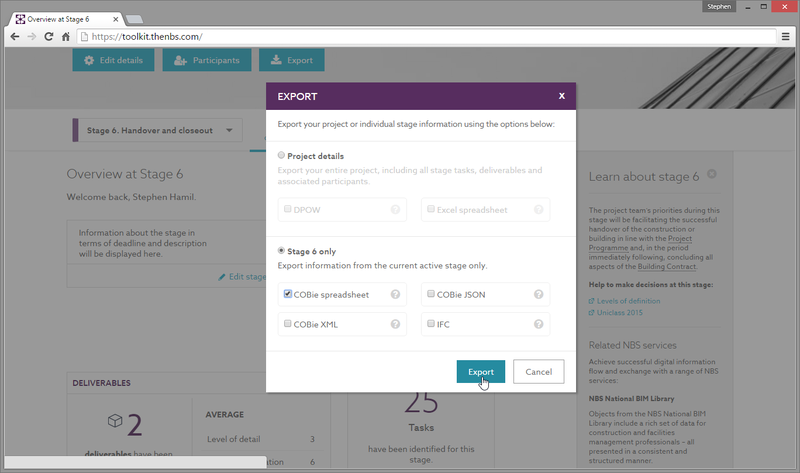 Figure 2.2 - The new project wizard. For the project: location, function and area. For each stage: expected construction cost, expected construction start and targets such as environmental impact measures. All of this information may be exported out of the Toolkit for easy inclusion in documents such as Employer’s Information Requirements. It can also be exported to a standard data structure and subsequently be imported into private areas of the Toolkit set up by other organisations. The import and export feature allows this information to go through the timeline. So the digital plan of work slowly grows from the information that defines an Employer’s Information Requirements through to being part of a BIM Execution Plan, then the Master Information Delivery Plan and then the Design Responsibility Matrix. By having this in a standardised digital structure, information is not lost, it does not have to be rekeyed and the process of learning new methods of working on new projects is greatly reduced. As the information in the digital plan of work grows through the design phases of a project, deliverables are identified that meet the initial client requirements. At the concept stage these deliverables may be spaces and elements; an example of this could be a railway platform that must be designed to withstand certain occupancy levels and have specific security and accessibility requirements. Moving through the developed and technical design stage, the design deliverables to meet these initial requirements will be at the level of systems and products; examples of this could be the access control and video surveillance systems and the floor finish and FF&E for the platform. Each of these deliverables is the responsibility of a role. Each role is assigned to an organisation. 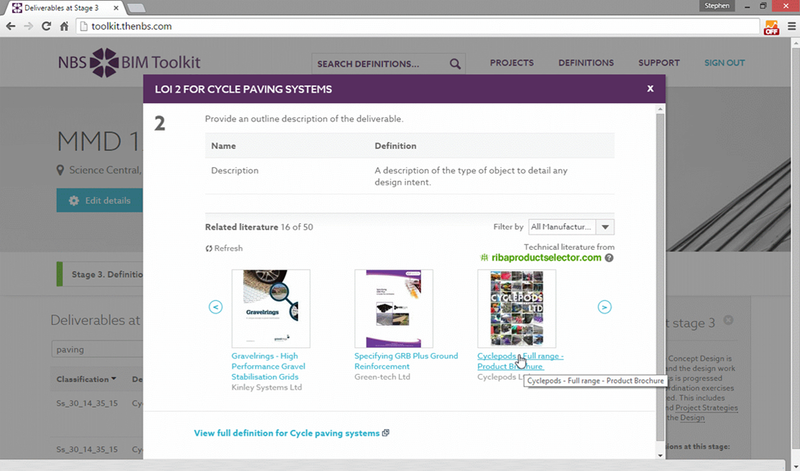 Figure 3.1 below shows a set of deliverables at the technical design stage. It can be seen that, for this stage of the project, the retaining wall system is the responsibility of the civil engineer and a short description has been added to this item. 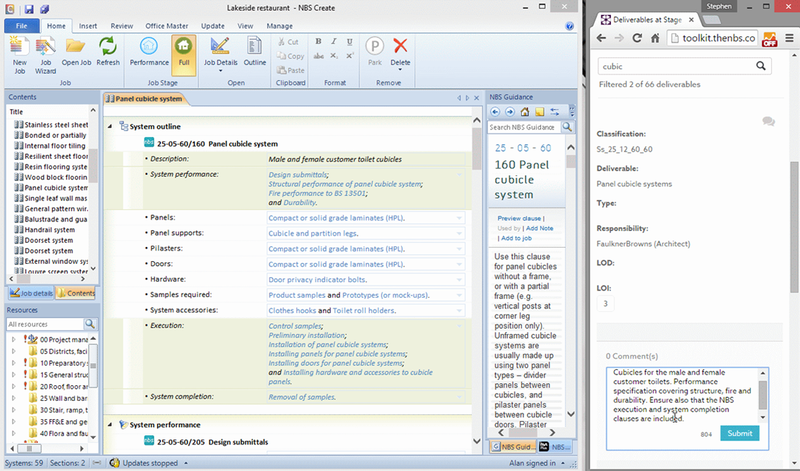 Figure 3.1 also shows reference codes for level of detail (LOD) and level of information (LOI). These reference codes are taken from the level of definitions reference library that is included as a key part of the toolkit. LOD is the geometric representation of the deliverable that is required and can be relied upon. LOI is the associated information that is required. This split of LOD and LOI allows the BIM process to start to focus more on information requirements and not purely on geometry. The reference codes indicate what may be typical of a particular project stage. However, every project is different and a private client, for example, may know LOI-5 at Stage 1 of a project. What is key is that there is a standard library of definitions to form this construction language stating what is being delivered by who and when. Figure 3.2 shows LOD-2 for a boiler. In terms of geometry, this modelled deliverable is quite simple; however, it can be seen that operation and maintenance zones are required to ensure that the “In Use” stage of a project is being considered from an early stage. Figure 3.3 shows LOI-3 for a buried expansion joint system. A recent enhancement to the BIM Toolkit allows deliverables at a higher level of classification be added at the early stage of the project when there is still uncertainty. This can then be refined at a later stage as the project progresses. For example, at the start of the project, the client may know that a heating system is likely to be required and that this will be the responsibility of the building service engineer. They can add this high level requirement, noting some lessons-learned from previous projects and specify that they would like to know the type of heating system at a specific stage. 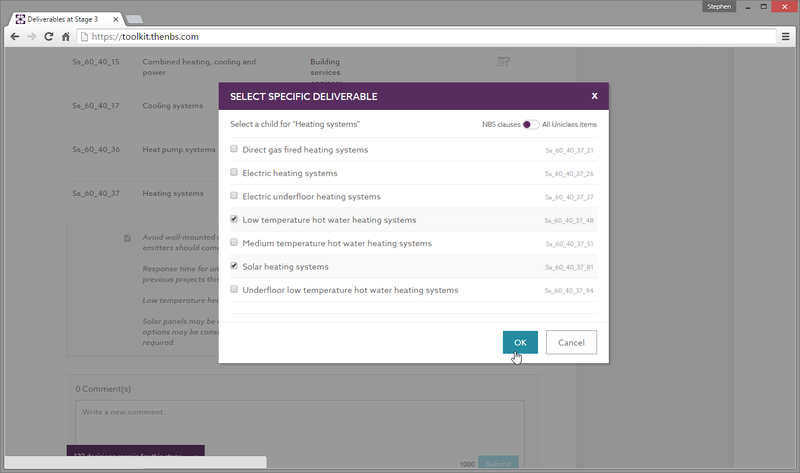 Later in the project, once the concept design is complete, the specific type of system can be selected using the functionality provided. This could equally apply to the handover stage of a project where the client knows they require information about the boiler and the heat emitters but not yet which specific products will be installed. This is illustrated below in Figure 3.4 and Figure 3.5. All deliverables in the Toolkit are arranged by Uniclass 2015 the new unified classification system. 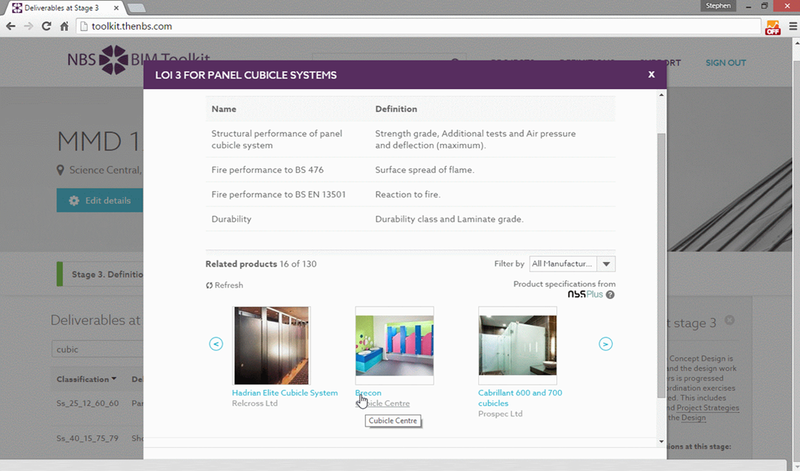 Uniclass 2015 covers the whole construction industry and has consistent classification tables from the largest objects such as built facilities down to the smallest such as construction products. As part of the Toolkit project, NBS has adopted a classification-mapping strategy. 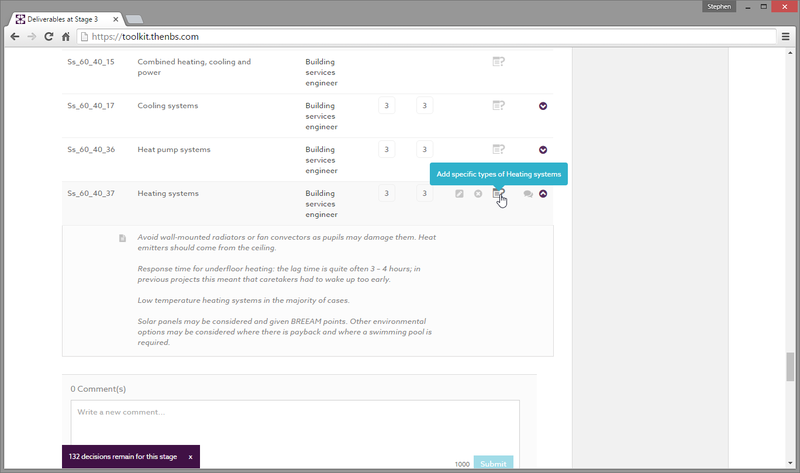 Examples of classification mappings in place include system mapping to RICS NRM1 and system and product mapping to NBS Create specification reference codes. Discussions are also taking place looking to add further mapping to systems such as CESSM and SFG20. This digital mapping will provide the opportunity to connect data together in ways that improve efficiency and accuracy in the future. One particular useful piece of functionality that is already developed is the ability to automatically generate a set of specifications for the design team from the deliverables defined in the plan of work. It is expected that the project lead will own the digital plan of work. At project team meetings this may be shown over a projector or a web-meeting to ensure that all team members understand their responsibilities and can report on progress. 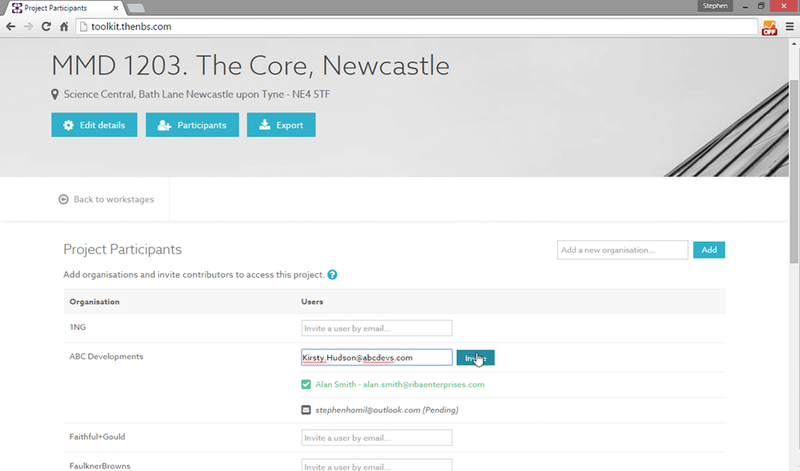 The BIM Toolkit also allows the administrator of a project to invite other team members to access the project as ‘contributors’. Contributors may not edit the main items in the plan of work, but they do receive web-access to the project and can post comments against tasks and deliverables. 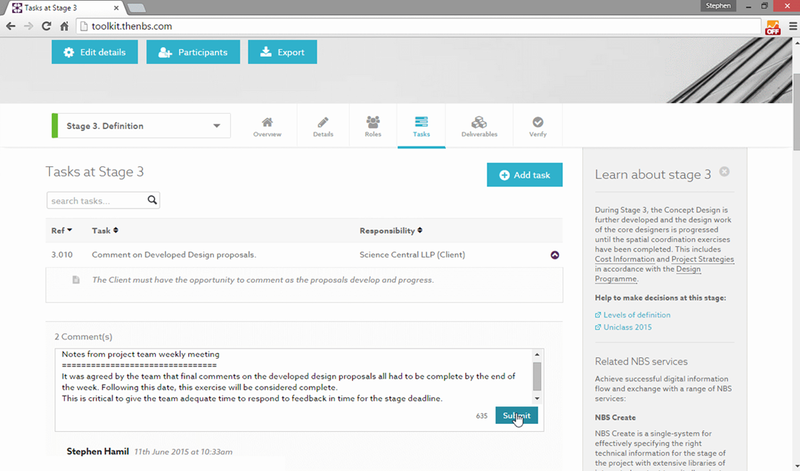 This allows the digital plan of work to become a reference source that can be used by each member of a collaborative project team on a daily basis. A team member may position the plan of work to the side of their screen whilst writing documentation, designing or specifying to ensure that their responsibilities are progressed according to the agreed plan. Where any comments need to be added, they can be posted against the relevant item. NBS is also making it easier for project teams and construction manufacturers to connect digitally. At an early stage of a project, manufacturer’s technical literature is easily accessible. 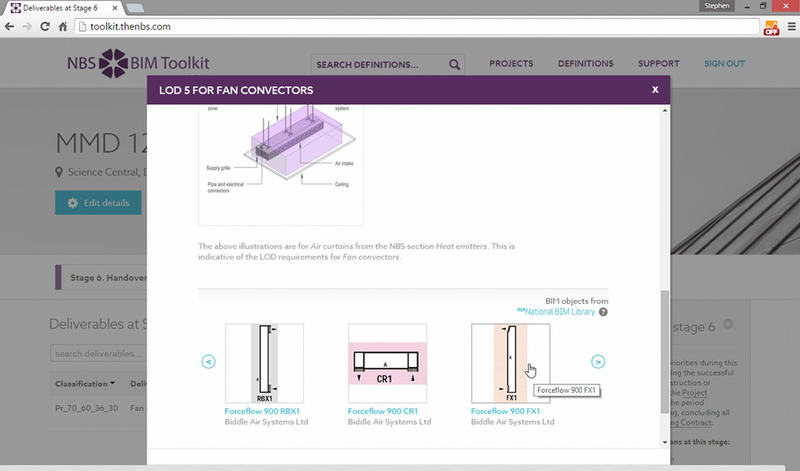 As the project progresses, free-to-use BIM objects and manufacturer product specifications are accessible through the toolkit. Figures 5.1, 5.2 and 5.3 below show how this supplier information is presented in a relevant context; for example the role responsible for the fan convector at stage 4 of a project will see BIM objects for fan convectors that can be quickly dropped into a design model. 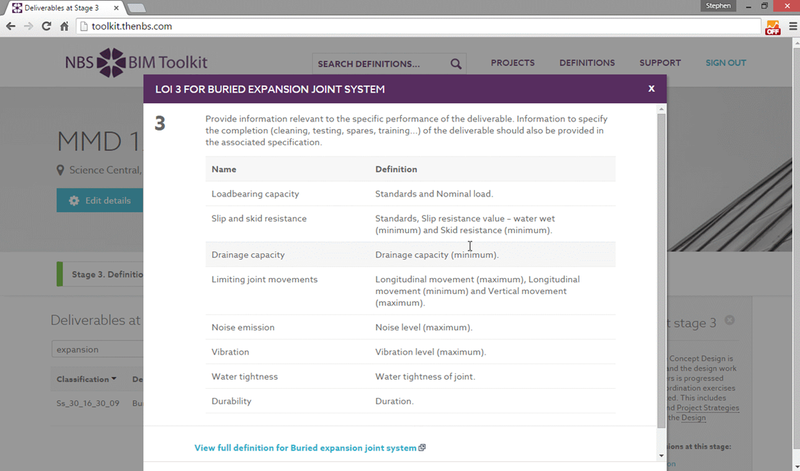 A final part of the Toolkit to introduce is the verification functionality. NBS worked closely with BIM Academy to adapt their open source xBIM software development kit to provide functionality to verify the information delivered in terms of what was requested. This functionality is still ‘beta’ and more work needs to be done, but some fantastic progress has been made that shows the power of standardised well-structured data. Figure 6.1 below shows that the information within a stage of a digital plan of work can be easily exported to the COBie data format. Figure 6.2 below shows a COBie file at handover being verified in terms of the LOI-6 properties of the systems and products that will be operated or maintained during the asset’s ‘In Use’ phase. The verification tool will identify the correctly classified objects and check their properties to verify that the required data is present. 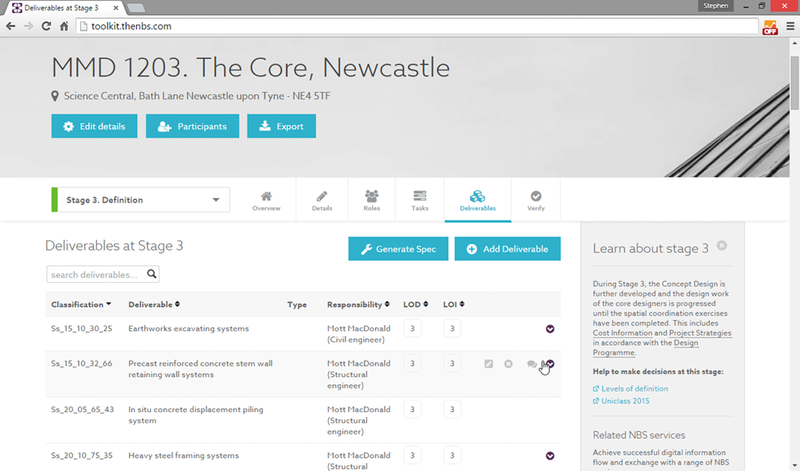 The NBS BIM Toolkit is free-to-use and forms an important part of ‘BIM level-2’. It provides benefits to clients in allowing them to define consistent digital information requirements and refine these as lessons are learned from previous projects. It also minimises risk and uncertainty within the supply-chain by allowing those managing this information flow to define who is doing what and when. 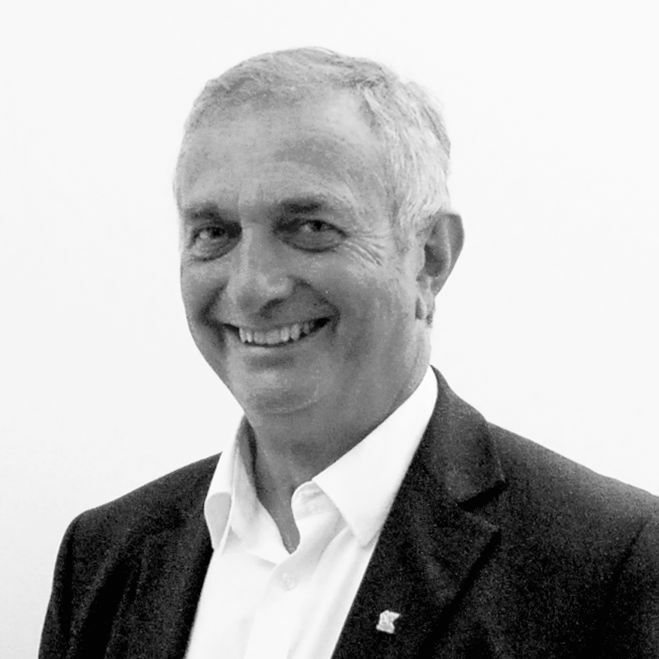 The provision of thousands of definition templates, a new unified classification system and a digital plan of work tool will hopefully help take away any of the remaining barriers in the industry in terms of BIM level-2 digital collaboration.